One of the top few concerns of a webmaster is the ever-persistent sense of insecurity. No matter how secure your site is, there will always be loopholes providing malicious programs an entry into your system, and thus enabling them to inject spam or malware. In spite of all preventive measures, the best and most practical thing to do in such an event is to recover your site as fast as possible so that the effect of the attack is neutralized / minimized. And with Google Webmaster Tools, you can now take a step forward towards easier and faster website recovery. The Google Webmaster Tools team has been working to make recovery for hacked sites easier, and to streamline the cleansing process. For this purpose, a new dedicated Help Portal has been set up. It contains detailed and really helpful articles and tutorials, some accompanied with videos that explain each step of the recovery process. In addition to this, Google will also notify webmasters when the software they're running on their site is outdated. 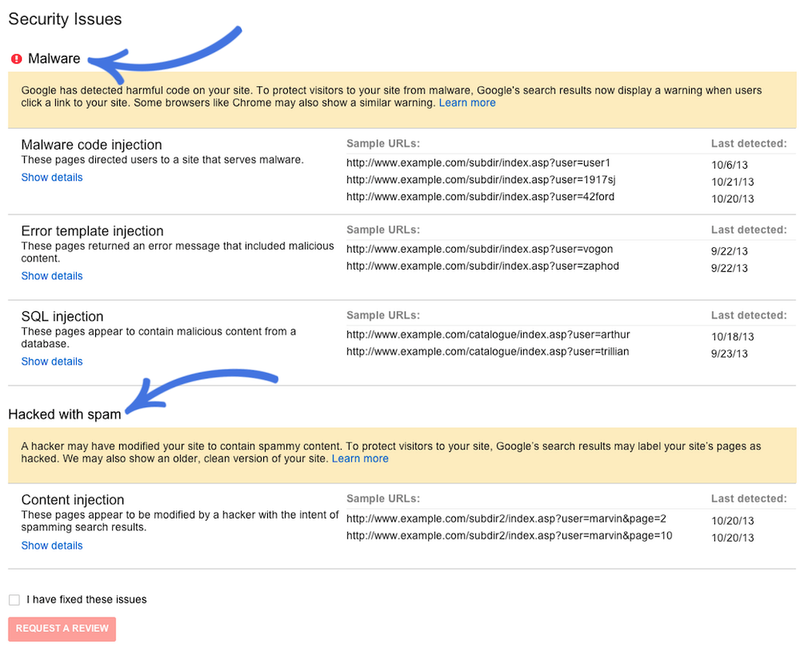 A new feature has also been added to Webmaster Tools, called Security Issues (which we'll discuss below). On the Security Issues page in Google Webmaster Tools, you will see all malicious activity going on on your website, including spam or malware injected by hackers. You can see it all in on place. This information includes the one previously available in the Malware section, along with new one regarding spam activity. On the Security Issues main page, you can see the type of hacking, sample URL(s) (if available), and the date the issue was detected. The Requesting a Review process has been simplified as well. Once you’ve cleaned your site and closed the security holes, you can request a review for all issues with one click of a button straight from the Security Issues page. Hey, Qasim. Nice ideas for recovery. i remember when my first site got hacked. I was so irritated. I had like 1800 views in just 2 months. But, all the work went in the drain. i hope, these services were available then. By the way, a side not, please take care of your comment area. Because, it's being spammed a lot. I agree, we get a lot of spam here. A lot of it, we delete. But its mostly manual spam entered by humans, and not auto-generated by bots. So there's not much we can do except manually go through all the comments and approve/disapprove them.